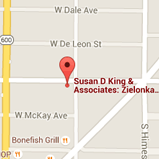 Welcome to Dr. Susan D. King & Associates, P.A. We love creating healthy, beautiful smiles for our patients. Dr. Susan D. King and our team deliver dental care that helps our patients achieve optimal oral health and incredible smiles, one person at a time. Each of us understands that your dental needs and goals are unique. That’s why you’ll always be treated as an individual, with Dr. King developing a custom treatment plan that’s right for your situation. Ours is a friendly, family-oriented practice where we respect you. We strive to develop long-term relationships with each patient, getting to know them as a person not just a set of teeth. Our compassionate, warm team members are here to help and encourage you to achieve a healthy, beautiful smile. If there’s ever anything you need, please let us know! Our Tampa, FL dental office serves St. Petersburg, Clearwater, Brandon, and surrounding communities. To learn how Dr. King can help you develop a healthy smile and schedule a visit, please call. We all look forward to welcoming you to our dental family. It will be our pleasure to start you on the path to a confident, beautiful smile you’ll love to share!